When I was little, I used to remember birthdays by party themes and presents. There was my fabulous pink themed party, with hot magenta and bubble gum pink stuffed animals hanging from the ceiling. The birthday where all the kids swung eagerly at a pinata, unable to crack it, forcing Dad to come to the rescue. And who could forget the birthday I was presented with my own Barbie bicycle, complete with sparkles on the handlebars? But these days, I remember birthdays by the people and the food we celebrated with. The year my Pubah carried out a hamburger cake to my utter delight. Or the birthday cake decorated with plastic dancing princesses, which I still have in a box under my bed. Even the famous family mashed potatoes I’ve requested for every single birthday dinner of my life, since I can remember. Last year, I invited two of my closest friends over and we made dinner: 3 different kinds of pasta from scratch, mixing and rolling out the dough right on the table. It was the perfect low-key sweet 16, memorable and intimate and tasty. Turning 17 was a little different. It seemed less important, less of a “big deal,” and there were no balloons or real parties. The only celebratory thing I did was eat at Salty’s, a pricey and stunning restaurant (more on that later.) In fact, it felt like an average April day. But little things made it special… from my friends singing happy birthday at lunch to my beautiful birthday dinner, it was made even sweeter. Click to read about dinner at Salty’s and how I assembled this showstopper chocolate cake of my dreams. For my birthday meal, Salty’s was amazing. The restaurant is nationally acclaimed, a valet took our car, and we sat with a postcard perfect view of the waterfront and downtown Seattle, but Salty’s is unpretentious. I told them it was my birthday when I made reservations, so there were bright balloons waiting at our table. When we arrived, the sun was just about to begin setting, and the whole skyline sparkled blue and silver. By the time we left, the sky had darkened, traces of gold were leaving the sky, and the whole city glittered. Our appetizer, coconut tiger prawns with a spicy Thai chili sauce and a tangy citrus sauce, was probably the best thing we had. So light, it melted in our mouths… I ate every single shred of toasted coconut off my plate and refused to drink any water, savoring the flavor as long as I could. My entree was also great. Cedar smoked wild Coho salmon with mashed potatoes, tomato beurre blanc, and spring pea greens with a bacon vinaigrette. I ended up having birthday potatoes after all! (Though I missed Dad’s.) No photo of this – it’s impossible to avoid blurriness in a restaurant, sorry. But chocolate cake is my favorite. I don’t find vanilla boring, and I do like lemon and carrot, but there’s really nothing like a classic, mile-high chocolate cake. Like this one, made just for my birthday. It’s so tall it doesn’t fit in my cake carrier. It’s incredibly moist, so intense it’s nearly black. I’ve never had such soft, rich, dark chocolate cake before. It’s rich, but the chocolate flavor isn’t overwhelming. Good thing, because it’s covered in melt-in-your-mouth ganache. But what flavor to choose? It didn’t take long before I settled on raspberry. Fresh berries are something I rarely have with because they’re so expensive, but I made an exception for my birthday. 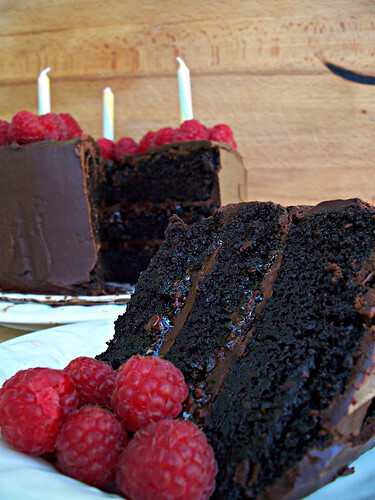 Raspberry jam and raspberry ganache between the layers of my cake, and fresh raspberries on top. Delicious. What a special cake. It’s super rich. Eat it in teeny tiny, dark and aromatic slices, as it’s truly death by chocolate. I’m submitting it into Poornima’s “For the Love of Chocolate” event as well as my Mini Cocoa and Banana Pavlovas. Sift the flour, sugar, cocoa powder, baking soda, and salt into a large bowl and whisk to combine. Whisk in the oil and sour cream, then gradually beat in the water. Add the vinegar and vanilla and mix to combine, and finally beat in the eggs until the batter is well combined. Divide among the three cake pans. Bake for about 35 minutes, or until a toothpick comes out almost clean. Cool in the pans for 20 minutes, then invert onto a wire rack and peel off the parchment paper, letting the cakes cool completely. These cakes are very soft, and it helps to freeze them for 15 minutes at this point. While the cakes cool, make the Raspberry Ganache. If the cakes are not flat, use a serrated knife to even the tops. Place one layer onto a parchment-lined cardboard cut out and spread 1/3 cup raspberry jam. Cover the jam with a thin, 1/4″ thick layer of raspberry ganache. Top with the second layer and repeat. Then invert the final layer and place on top. To frost the cake, start with a crumb coat: barely cover the entire cake with a thin, see through layer of ganache. This is to help create a smooth finish later. Chill the cake for 10 minutes. Frost the cake with the remaining raspberry ganache and top with fresh raspberries. I would recommend leaving the cake at room temperature to prevent the ganache from becoming too brittle. Bring an inch or two of water to a simmer in a medium saucepan. As the water heats, microwave the raspberries in 1 minute intervals, stirring and mashing with a fork, until they become a smooth liquid. Pour through a strainer (should yield 1/3 cup raspberry juice) and set aside to cool. Place the chopped chocolate and the butter in a large heatproof bowl and set over the saucepan. The bowl should not touch the water or fall more than halfway into the saucepan. Stir until the chocolate and butter melt, then gradually add in the slightly warm raspberry juice, whisking to combine. Take the ganache off the heat and let cool until spreadable, stirring once in a while. * The ganache was almost too sweet, but I used a combination of semisweet and bittersweet chocolate. Use the bitterest, darkest chocolate possible to counteract the sweetness of the berries. That triangular crack is from the beautiful candle that I pulled out of my slice. I’ll tell you when my wish comes true. 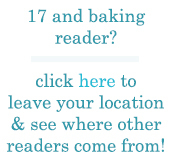 Miss 17 and Baking is 17 at last! Entry filed under: Cake/Cupcakes. 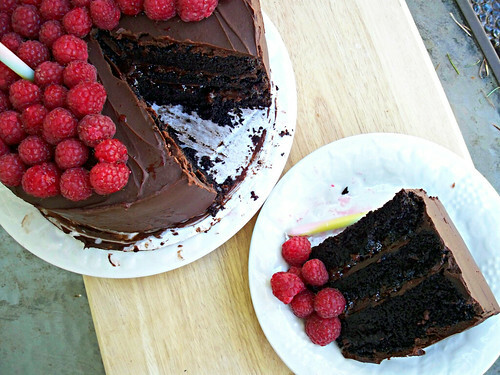 Tags: cake, chocolate, Eating Out, layer cake, raspberries. it’s so delicius, can you give me one of them? Could I substitute strawberry for raspberry? Or do I just need to find another recipe? I’m from the UK, do you have these measurements in Grams and millilitres please? I am looking forward to creating this lovely and decadent dessert for my daughters 18th birthday this weekend, February 12! She requested the flavors which are my favorites also. Thanks for sharing!